Scooter-for-Sale.com is owned by MADEMOTO Vehicles Company Limited. 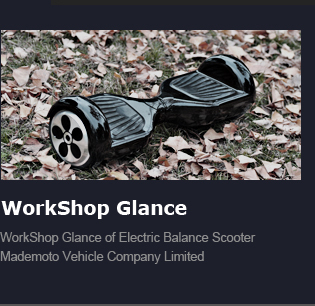 It is a displaying and communication platform specially for electric balance scooter. MADEMOTO Vehicles Company Limited (Business Registered Number: 37134098) was established in 2004. We specialize in various types of Leisure & Sport Vehicle developing and manufacturing. Our main products are portable light electric scooters and other Sports & Fun products. Electric Balance Scooter, also called SCV(Sensor Controlled Vehicle). It means: the vehicle is controlled by Sensor. The SCV are consisted of Scientific, Fashion, Fun and Environment Protection Sensor Controlled Vehicle. How to drive the Balance Scooter? 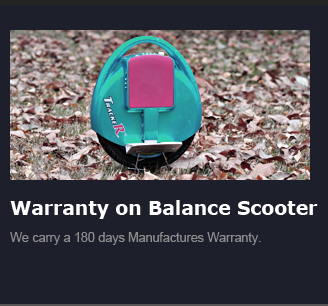 Our SCV(Sensor Controlled Vehicle) is similar to other body balance scooter, when the body gravity is forwarded, to keep the balance, the vehicle will be forwarded. Same on the backward direction. Meanwhile, Body gravity slant left or right to keep the vehicle running directions. The balance Scooter is the best solution for the last mile in urban transportation. You can step on the balance scooter running on the outdoor, Easy moving on the urban street without any barrier. The scooter power is from a lither battery set, single charge range can be 20km, and keep running on 15km per hour. Our balance scooter power is supplied by lithium batteries, zero carbon displacement. And we have adopt power regenerated technology, it enables our Balance Scooter battery can be charged while the scooter is downhill. The gravity energy is converted to electric energy maintains good power circle. We have also improved the electric motor mechanical performance and low down the running noise. The electric balance scooter is very small, the scooter panel size is similar to a pair of shoes, easy handle. Light weight easy portable. 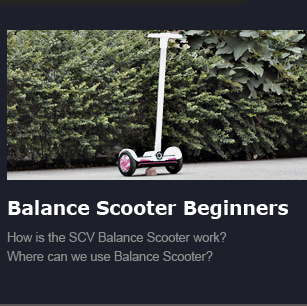 Our SCV Balance Scooter is easy driving on standing position. The rider just adjusted his body gravity to control scooter directions and running speed. So the hands are free. The urban bus or metro cannot reach, our balance scooter will bring you there. Max speed 15km per hour, range 20km per charge. The balance scooter keeps the Digital Video, Mobile and Camera shooter stable when people recording a film. It is a movable shooting platform. We can connect our electric balance scooter to APP Applications on our mobiles. Running status such like power level, range, speed information etc, all can be displayed on your mobile.